Donna MacDuff moved from the UK to the US in 2003 to do a PhD at the University of Minnesota. 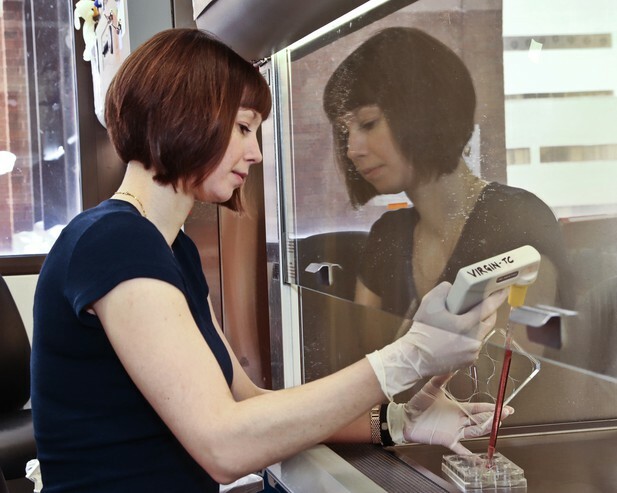 She is currently an Instructor at Washington University School of Medicine in St Louis, where she studies how inflammation is controlled during different types of infection. Outside of the lab, she competes in badminton tournaments all over the Midwest. Donna MacDuff. Image credit: Nichols Photography. What attracted you to studying immunology? I became interested in viruses and how they are controlled by the immune system, or not controlled in some cases, while taking undergraduate classes in pathology. For my PhD, I studied how the process that allows antibodies to adapt to bind very specifically to their targets, such as pathogens, is controlled. At the same time, I found that the protein I was studying was also able to hinder the replication of a particular type of virus. After that, I moved to St Louis to try to identify new genes that enable the immune system to protect us from infections and to discover how these genes work. I say I am interested in how the immune system senses different infections and generates the best type of immune response to control a particular infection, while keeping the self-inflicted damage to the body to a minimum. Some human patients who are unable to control certain types of bacterial infection and who unexpectedly experience inflammation have mutations in a particular gene. I am trying to understand how this gene works in the immune system. We found that a persistent, or chronic, herpesvirus infection can alter the symptoms of an immunodeficiency in mice (MacDuff et al., 2015). We were studying mice with a genetic mutation similar to those seen in human patients. The mutant mice were extremely susceptible to some types of infection, such as the Listeria bacteria, but more resistant to other types of infection, such as a mouse herpesvirus or the bacteria that cause tuberculosis. We found that if the mutant mice had a chronic herpesvirus infection, they were no longer susceptible to infection with Listeria – they no longer appeared to be immunodeficient. This was also true for three other strains of mice with different genetic mutations that make them more susceptible to infection with Listeria. In the last few years, we have heard a lot about how the bacteria that are constantly present on our skin and in our intestines influence our health and immune systems. However, humans are also chronically infected with many different viruses, including herpesviruses, and these microbes can also influence how our immune systems work. Some people inherit genetic mutations that make their immune system less able to respond to and fight infections, or more likely to attack their own tissues. However, people with mutations in the same gene often show different symptoms. Our findings suggest that persistent viral infections may influence, or even mask, the symptoms associated with genetic mutations that affect the immune system. I am currently interested in how the immune system is controlled at sites in the body where microbes are constantly present and detected, such as in the intestine. How do the immune system and bacteria co-exist relatively peacefully so that the intestine is not damaged by inflammation when the bacteria are sensed? How does this change when a pathogen is present? How and why is this balance upset during inflammatory bowel disease? When my paper was accepted for publication at eLife, of course! Thankfully, nothing particularly horrific springs to mind. Like most people, I have had experiments fail, and grants and papers rejected, which are not very pleasant at the time, but they are important learning experiences. When I was an undergraduate, I made a plasmid to delete a gene in a cell line. I put the plasmid into the cells, but I did not recover any cells with the gene deleted. I then discovered that part of the plasmid was backwards, which accounted for the failed experiments. As my first experimental failure, it has stuck in my mind. The late Michael Neuberger was probably the person who has influenced my career path the most so far. He provided me with several important opportunities as an undergraduate at Cambridge, including a summer research studentship in his laboratory that gave me my first taste of real science. Since then, my PhD and post-doc mentors, Reuben Harris and Skip Virgin, respectively, have played major roles in shaping the way that I think and my approach to science, and have been extremely supportive. I think science is done differently in different places, so it is difficult to say. Perhaps more collaboration and less direct competition would help us to move forward and make new discoveries faster. But the competitiveness also keeps us on our toes and drives us to be more productive and successful scientists. I think more funding opportunities for early career scientists, or at least fewer restrictions on the eligibility for funding, would be helpful. I play badminton regularly at a local club, and travel to tournaments several times a year to compete. Yes, but it helps to incorporate activities outside of the lab into my weekly routine. I would like to be doing exciting science alongside smart and talented people in a collaborative and supportive environment. On a cold and windy October day in Minnesota, my PhD advisor and I went fishing on a lake in a canoe to try to catch a type of fish called a Walleye so that I could clone a Walleye gene. We failed miserably. A scientist pulls the lever and receives an electric shock. Their response: “I wonder if that happens every time”. 2013–present: Instructor, Washington University School of Medicine, St Louis, Missouri, USA. 2008–2013: Postdoctoral Fellow, Washington University School of Medicine, St Louis, Missouri, USA.